On Tuesday, March 13, a group of gun rights advocates packed the Vermont statehouse in Randolph to voice their thoughts on Vermont Bill S 22. 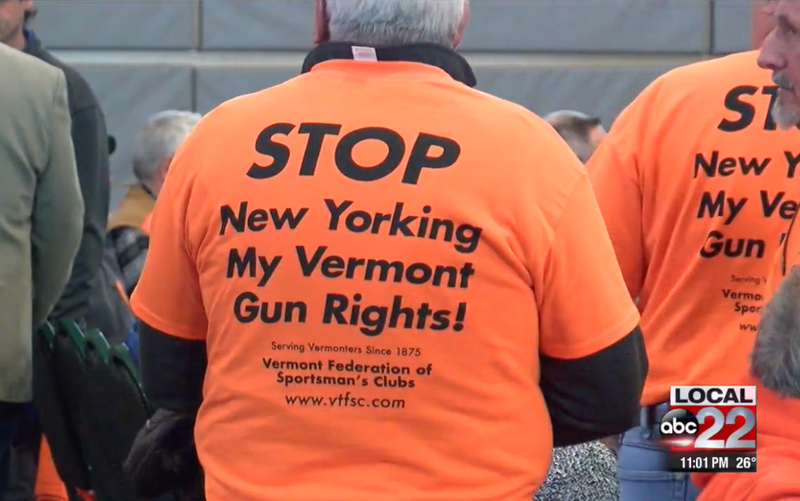 The Vermont Federation of Sportman’s Clubs, clad in “hunter orange” t-shirts with the statement “Stop New Yorking My Vermont Gun Rights” they turned out en masse over the bill. S 22 has two provisions: one is to create a 48 hour waiting period before a gun can be purchased. The other is mandatory gun security. Advocates are convinced that the 48 hour waiting period would prevent suicides. Not really. Subject: Criminal procedures; firearms; waiting periods; safe storage. Statement of purpose of bill as introduced: This bill proposes to: (1) require a 48-hour waiting period for all firearms sales and (2) require that, when a firearm is not in a person’s immediate possession or control, the firearm must be locked in a safe storage depository or rendered incapable of being fired. “It is hereby enacted by the General Assembly of the State of Vermont: Sec. 1. 13 V.S.A. § 4019a is added to read: § 4019a. FIREARMS TRANSFERS; WAITING PERIOD (a) A person shall not transfer a firearm to another person until 48 hours after the completion of the background check required by 18 U.S.C. §922(s) or section 4019 of this title. (b) A person who transfers a firearm to another person in violation of subsection (a) of this section shall be imprisoned not more than one year or fined not more than $500.00, or both. SAFE STORAGE (a) A person shall not store or otherwise leave a firearm outside his or her immediate possession or control without having first securely locked the firearm in a safe storage depository or,by use of a tamper-resistant mechanical lock gun lock or other device appropriate to that weapon, rendered it incapable of being fired. The uncomfortable fact is that waiting 48 hours is not likely to stop a person from suicide. They’ll normally just wait it out. It might stop a few, but it certainly won’t stop many, especially if the person already has access to a weapon – any weapon. Instead of looking at the tool, Vermont should be focusing on the mental issues that cause the problem in the first place. There are general signs when someone is thinking about suicide: giving away beloved pets, or prized possessions as an example. A sudden uptick in the person’s countenance and attitude when they were often feeling more “dark” and talking about the deaths of others. They may sound much better and even smile more. It can lull you into thinking they’re fine now. It’s a deception. Why? It means they’ve made up their minds on what to do. And they usually have already determined the method. Running out to buy a gun at the last minute may not be on the menu. Having lost a few friends and parishioners over the course of time, I know that those things are real. They need intervention, not a gun law. A 48 hour waiting period could also get someone killed, especially in the case of domestic violence victims. The firearms storage part of the bill, as we have noted before, renders a gun useless in a self defense situation. The bill was first read in January, and referred to the Vermont Judiciary Committee. The hearing on March 13 was a public one regarding the bill. It is unclear whether the bill has passed the committee – the vote was to be on March 15, and proponents hoped to get it to the floor of the state Senate sometime this year.